The Rehabilitation Of Michael Vick : Blog Of The Nation When then-Atlanta Falcons quarterback Michael Vick got busted for his connection to a dogfighting ring, Sarah Handel was, if not devastated, certainly disheartened. Since then she's been looking for evidence he truly understands the cost of dogfighting. 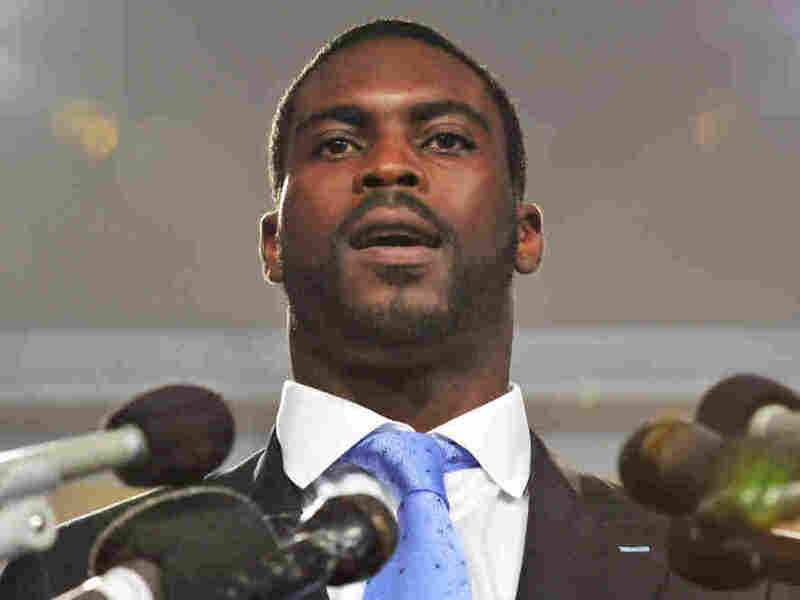 NFL quarterback Michael Vick joined federal lawmakers and the Humane Society of the United States calling on Congress to pass H.R. 2492, the Animal Fighting Spectator Prohibition Act. When then-Atlanta Falcons quarterback Michael Vick got busted for his connection to a dogfighting ring, I was, if not devastated, certainly disheartened. I've been around the block and know athletes are no angels, necessarily. Two incidents are starkly clear in my memory: Michael Jordan's gambling issues, and Rafael Palmeiro's steroid use. Both were beloved favorites of mine, and both fell in dramatic, public fashion. I grew up a huge Michael Jordan fan, like so many of my generation. I loved Rare Air and have even been known to tell people exactly what makes Space Jam so awesome. I still have my Dream Team t-shirt. But most of all I loved watching him play. Writers more skilled and experienced than I have told this tale a million times, but once, I got to see him in person versus the Washington Bullets (now Wizards). Improbably, the Bullets won that game, but I'll never forget the classic moment when Jordan broke away the pack for a length-of-the-court drive to the basket that culminated in a soaring slam dunk. I can watch it in my head like television, to this day. My memories of Raffy in his heyday aren't as vibrant, but they're almost more poignant. I've gone to Orioles' games regularly throughout my life, and his first stint with the Orioles got rolling shortly after the team moved into its new ballpark and things were really exciting. Trips to Oriole Park (and Memorial before it) still feel like coming home, and my memories of Palmeiro are wrapped tightly in a warm feeling of family. My Michael Vick story is similar. Vick first popped up on my radar as a quarterback at Virginia Tech, where a dear family friend was a student. Our families went to see him play on Thanksgiving at Tech's annual match up against UVA, and though it was a hard, cold, damp day, we all came away from it talking about his speed and agility. We were smitten. And even when his typical star athlete braggadoccio emerged in Atlanta, I thought, what the hell — he was a number one draft pick, he's entitled to a bit of that. So when news broke that he was definitely, reprehensibly involved with Bad Newz Kennels, I was heartbroken. In part because of how much of a fan I was, but in larger part because of the specific infraction: cruelty to animals. To me, there are a few worse things, but not many. Because of that, I've followed his story since his release from prison a bit more carefully than I did Jordan's or Palmeiro's. And through it all, I've been searching for the clear evidence I need that he truly believes dogfighting is wrong — not just that you can get in trouble for it, but that it's wrong. "It's almost as if everyone wanted to hate me. But what have I done to anybody? It was something that happened, and it was people trying to make some money." He pauses and looks around. Time to step back from the edge. He's recovered so much ground that he's not about to lose it all again by taking things too far with some writer he just met. "But it's not fair. It's not fair to the animal. I know what to do now. I am strong as an individual, and I can handle anything." I don't want animals to continue to be hurt. I don't want kids to end up in prison behind pointless activity. Hurt. That Vick chose that word to describe what happens to the dogs offers a glimmer of hope. But just a glimmer — he follows that immediately with the human consequences, not the canine. So I'm going to keep listening and reading, and keep hoping that Vick's incredible image rehabilitation amounts to his actual redemption.